The Sound Devices 688 Mixer Recorder combines performance, reliability, and integrity of sound quality, to help production sound engineers thrive on even the most complex productions. With its multi-channel mixer, two powerful auto mixers (Dugan and MixAssist™), and integrated 16-track recorder, the 688 was designed with high-demand versatility in mind. Vertical meter displays, improved menus, and the ability to save custom configurations make live monitoring and on-the-fly adjustments simple and quick. 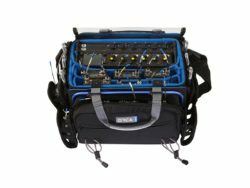 Its portability, durability, and impressive feature set, make it capable of fitting into any production scenario, from bag to cart-based workflows.